how they utilize them in the management of their farms and ranches. In early 2018, researchers from the University of Saskatchewan surveyed cow-calf producers to better understand the level of adoption of herd data management tools, as well as the practices associated with greater utilization of these tools (e.g. bioTrack, HerdTrax, Cattlemax). Using data from a survey of 62 ranchers in Saskatchewan, we find that a majority of respondents (74%) maintain records in an electronic format, while some still use paper records for a variety of reasons. 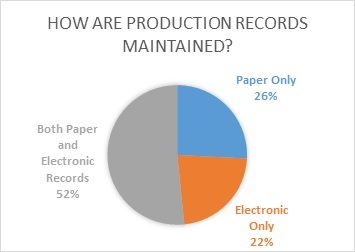 Approximately half of the respondents use both paper and electronic records. The Excel Spreadsheet is still the dominant form of electronic record keeping among respondents. While those farms that maintain records in paper format may still know a lot about their farm business, the use of electronic records would make analysis of areas of potential improvement easier to identify. Record keeping is often viewed as a key practice among commercial scale farms and ranches. Pruitt et al. 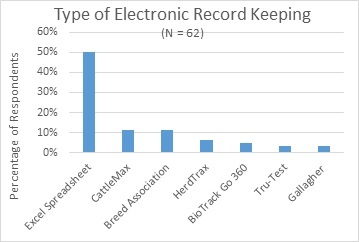 (2006) found that computer based record keeping was highly correlated with other technology adoption, including artificial insemination, the use of veterinary services, the use of a nutritionist, and forage testing. Recent work by Manglai (2016) found that cow-calf producers in western Canada that use records and benchmark performance to their own performance or to a peer group record-keeping and benchmarking also have higher production, measured in pounds weaned per exposed female. Maintaining production records allows for more accurate retrieval of historical information that may be used when making management decisions regarding the farm business. While paper-based records are better than no records at all, electronic records have the added benefit of ease of retrieval and ease of additional analysis. Several studies have shown that farmers that maintain records have higher levels of performance, measured in terms of productivity (Tomaszewski, 1993) and financial performance (Mishra, Wilson and Williams, 2009). It may also be the case that maintaining records electronically lowers the administrative burden when participating in industry initiatives that use records to facilitate compliance checks. 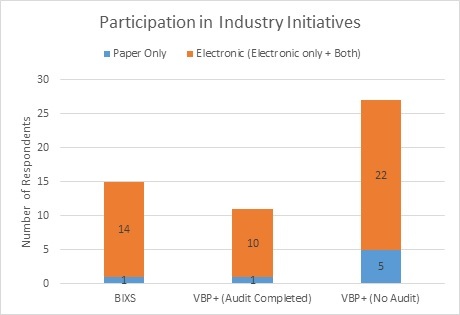 In our sample, only a small percentage of producers who kept paper-based records participated in these initiatives. The use of record keeping systems is important as this is one of the main sources of information that managers have in identifying areas of the business that are strengths and those that can be improved. Firms that collect data and can transform data into actionable information may be better able to identify opportunities for improvement in production efficiency. Using a case-based approach that involved interviews with five innovative producers in the U.S., Doye et al. (1990) suggest that production management and information management are highly correlated. Common threads through the cases included investments in human capital in terms of university education, as well as the use of qualitative and quantitative goals that were linked to long term plans of these farm businesses. Record-keeping may also be driven by the farm manager’s idea of what the ranch will look like in the future. For farms that are looking to expand, ranchers may want to focus on getting certain production and financial metrics in line with other high performing farms before they implement their expansion plan. This may be aligned with the old adage of get better before you get bigger. For a majority of farms in our sample (34/62), long term goals included expansion of the herd. 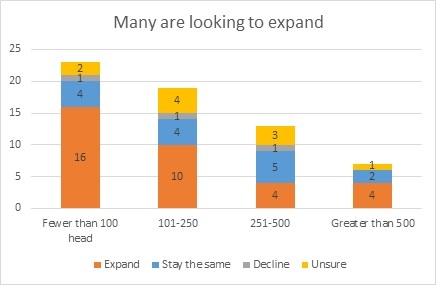 While this was largely evident in ranches with fewer than 100 head and 101-250 head, a majority of respondents with large herds also believed their ranch would expand in the coming years. For these firms, we would expect that record keeping activities would be valuable to identify areas where the farm business is performing below that of other high performing firms. Record keeping would allow for both self- and peer benchmarking that may lead to a reallocation of resources (time, effort, money) to address these shortcomings relative to other firms. As firms throughout size classifications are looking to expand, and each ranch may have differing views on the key metrics that are driving performance, record keeping and the analysis of these records may be what separates successful expansion plans with those that are less successful. 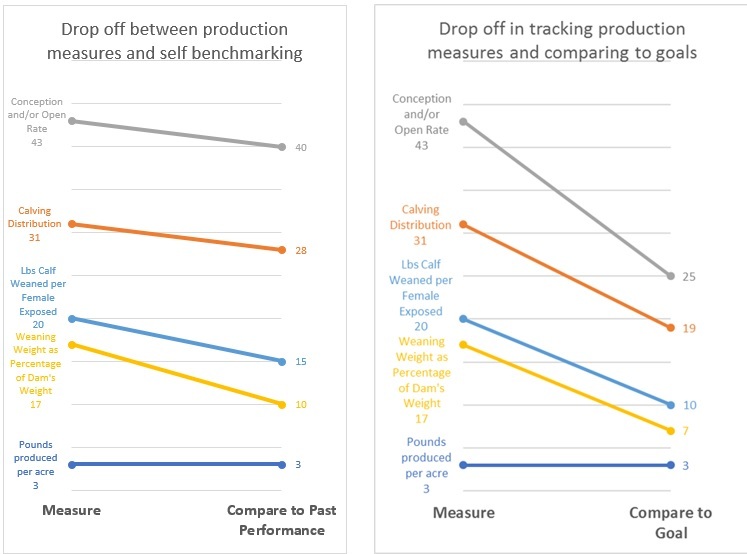 Data from the survey shows that nearly 70 percent of respondents (43 out of 62) track conception rates on their ranch, while fewer respondents track calving distribution, pounds weaned per exposed female, or weaning weight as a percentage of dam’s weight. While industry leaders and academics may wish these percentages were higher, they may not be inconsistent with the findings of Doye et al. (1990). The point of record keeping is to maintain records that matter to the long- and short-term goals of the farm business. The data shows that respondents seem to do a good job of tracking their own performance and comparing to recent history (self-benchmarking). What is troubling from the data is the considerable drop-off from keeping the measure to comparing the measure to a quantitative goal set by the manager. This point is illustrated by the consistency in measurement and comparing to a goal for the three respondents who track pounds produced per acre. For these ranches, we can assume that they have identified pounds produced per acre as an important metric in the performance of the ranch business, and therefore they make sure that they not only keep track of this data, but they compare performance to a stated goal. While production metrics are important and should be tracked, it is also important to track how these production measures map into financial performance. 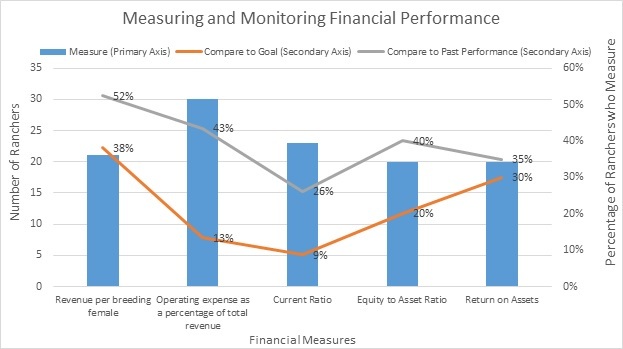 While tracking and analyzing financial performance may be more of a chore than that of production metrics, it is ultimately the revenue generated by the productive assets that ensure the long-term sustainability of the farm business. In this area, our results show that less than half of our respondents track key financial performance metrics that have been identified by beef extension economists. Here the data shows that ranchers do a better job of tracking expenses (50%), which may be expected, however there is still a considerable drop-off between the measurement of a financial metric and the comparison to past performance (43% of those measuring) or a goal (13% of those measuring). Even though we have a small number of producers in this sample, this result is potentially cause for concern as it corroborates other reports on similar management issues. Given the rise in the discussion of how incremental changes in production and financial metrics can have significant impacts on farm and ranch performance (see Danny Klinefelter’s 5% rule), the disconnect between the metrics that industry and extension specialists believe are important (and that ranchers view as important enough to track) and the actual comparison to a goal, is again puzzling. This initial look at record keeping among cow-calf operations provided some information on the manner by which a sample of Saskatchewan ranches maintain and utilize farm records. Some limitations to our study may include the small number of respondents that answered our survey as well as the measures we included in our survey. With these limitations in mind, we feel that the data still shows that ranchers can do more to extract greater value from the records they keep. Identify the key success factors of your ranch. What key measures would tell you that your ranch is heading in the right direction? Establish a goal for each metric. What should this measure be in coming year? What should it look like in five years? How is the firm performing relative to the goal? Determine the relevant benchmark to your operation. Benchmarks are different from goals in that benchmarks provide the manager with a sense of how they are performing relative to the benchmark, while a goal provides the manager with an aspirational target of achievement. Provincial benchmarks provide a peer or industry comparator of key production or financial metrics. Use benchmarks to identify productivity gaps. Benchmarks may highlight areas where the ranch is particularly strong relative to others in the industry, and areas where significant gaps in performance are evident. Depending on the metrics identified in Item 1 (above), this may signal to the manager that resources could be allocated to close these gaps if they are particularly important to the success of the ranch. Vestal, Mallory K., Clement E. Ward, Damona G. Doye, and David L. Lalman. "Beef cattle production and management practices and implications for educators." SAAEA Paper (2006). Gloy, Brent A., Jeffrey Hyde, and Eddy L. LaDue. "Dairy farm management and long-term farm financial performance." Agricultural and Resource Economics Review 31, no. 2 (2002): 233-247. Pruitt, J. Ross, Jeffrey M. Gillespie, Richard F. Nehring, and Berdikul Qushim. "Adoption of technology, management practices, and production systems by US beef cow-calf producers." Journal of Agricultural and Applied Economics 44, no. 2 (2012): 203-222. Manglai, x. "Examining Record Keeping and Benchmarking Effects on the Production and Performance of Cow-calf Farms in Canada." M.Sc. Thesis, University of Saskatchewan, 2016. Tomaszewski, Michael A. "Record-keeping systems and control of data flow and information retrieval to manage large high producing herds." Journal of Dairy Science 76, no. 10 (1993): 3188-3194. Mishra, Ashok, Christine Wilson, and Robert Williams. "Factors affecting financial performance of new and beginning farmers." Agricultural Finance Review 69, no. 2 (2009): 160-179. Doye, Damona, Robert Jolly, Rob Hornbaker, Tim Cross, Robert P. King, William F. Lazarus, and Anthony Yeboah. "Case studies of farmers' use of information systems." Review of Agricultural Economics 22, no. 2 (2000): 566-585. Stan Bevers and David Anderson. “Key Performance Indicator Targets for Beef Cow-calf Operations” EAG-018, Texas Agri-Life Extension. 2015. https://agrilifecdn.tamu.edu/amarillo/files/2015/12/EAG-018-KPI-BEVERS.pdf.